Spacetime arrives when supergravity separates into the combined nuclear forces (strong, weak, electromagnetic) and gravitation. Matter makes its first appearance during this era as a composite form called Grand Unified Theory or GUT matter. GUT matter is a combination of what will become leptons, quarks and photons. In other words, it contains all the superpositions of future normal matter. But, during the GUT era, it is too hot and violent for matter to survive in the form of leptons and quarks. Why can't matter remain stable at this point in the Universe's evolution? This involves the concept of equilibrium, the balance between particle creation and annihilation. During pair production, energy is converted directly into mass in the form of a matter and anti-matter particle pair. The simplest particles are, of course, leptons such as an electron/positron pair. However, in high energy regimes, such as the early Universe, the conversion from energy to mass is unstable compared to the more probable mass to energy conversion (because the created mass must be so high in mass to match the energy used). In other words, when temperatures are high, matter is unstable and energy is stable. Any matter that forms in the early Universe quickly collides with other matter or energy and is converted back into energy. The matter is in equilibrium with the surrounding energy and at this time the Universe is energy or radiation-dominated. The type of matter that is created is dependent on the energy of its surroundings. Since the temperatures are so high in the early Universe, only very massive matter (= high energy) can form. However, massive particles are also unstable particles. As the Universe expands and cools, more stable, less massive forms of matter form. As the Universe expands, matter is able to exist for longer periods of time without being broken down by energy. Eventually quarks and leptons are free to combine and form protons, neutrons and atoms, the ordinary matter of today. As the Universe cools a weak asymmetry in the direction towards matter becomes evident. Matter that is massive is unstable, particularly at the high temperature in the early Universe. Low mass matter is stable, but susceptible to destruction by high energy radiation (photons). As the volume of the Universe increases, the lifetime of stable matter (its time between collisions with photons) increases. This also means that the time available for matter to interact with matter also increases. The Universe evolves from a pure, energy dominated domain to a more disordered, matter dominated domain, i.e. entropy marches on. The last two stages of matter construction is the combining of three quark groups into baryons (protons and neutrons), then the collection of electrons by proton/neutron atomic nuclei to form atoms. The construction of baryons is called baryongenesis. After GUT matter forms, the next phase is for GUT matter to decay into lepton and quark matter. Lepton matter will become our old friends the electron and neutrino (and their anti-particles). But quark matter is unusual because of the property of quark confinement. Quarks can never be found in isolation because the strong force becomes stronger with distance. Any attempt to separate pairs or triplets of quarks requires large amounts of energy, which are used to produce new groups of quarks. With so much energy available in the early Universe, the endresult is a runaway production of quark and anti-quark pairs. Trillions of times the amounts we currently see in the Universe. The resulting soup of quark pairs will eventually suffer massive annihilation of its matter and anti-matter sides as soon as the Universe expands and cools sufficiently for quark production to stop. Notice that quark pairs are more stable than triplets, so that most of the quark production is done in pairs. Later, pairs will interact to form triplets, which are called baryons. Baryongenesis begins around 1 second after the Big Bang. The equilibrium process at work is the balance between the strong force binding quarks into protons and neutrons versus the splitting of quark pairs into new quark pairs. When the temperature of the Universe drops to the point that there is not enough energy to form new quarks, the current quarks are able to link into stable triplets. As all the anti-particles annihilate by colliding with their matter counterparts leaving the remaining particles in the Universe to be photons, electrons, protons and neutrons. All quark pairs have reformed into baryons (protons and neutrons). Today, only around exotic objects like black holes, do we find any anti-matter, anti-mesons (quark pairs) or any of the other strange matter that was once found throughout the early Universe. Soon after the second symmetry breaking (the GUT era), there is still lots of energy available to produce matter by pair production, rather than quark confinement. However, the densities are so high that every matter and anti-matter particle produced is soon destroyed by collisions with other particles, in a cycle of equilibrium. Note that this process (and quark confinement) produces an equal number of matter and anti-matter particles, and that any particular time, if the process of pair production or quark confinement were to stop, then all matter and anti-matter would eventual collide and the Universe will be composed only of photons. In other words, since there are equal numbers of matter and anti-matter particles created by pair production, then why is the Universe made mostly of matter? Anti-matter is extremely rare at the present time, yet matter is very abundant. This asymmetry is called the matter/anti-matter puzzle. Why if particles are created symmetrically as matter and anti-matter does matter dominate the Universe today. In theory, all the matter and anti-matter should have canceled out and the Universe should be a ocean of photons. It is not the case that the Universe is only filled with photons (look around the room). And it is not the case that 1/2 the Universe is matter and the other half is anti-matter (there would be alot of explosions). Therefore, some mechanism produced more matter particle than anti-matter particles. How strong was this asymmetry? We can't go back in time and count the number of matter/anti-matter pairs, but we can count the number of cosmic background photons that remain after the annihilations. That counting yields a value of 1 matter particle for every 1010 photons, which means the asymmetry between matter and anti-matter was only 1 part in 10,000,000,000. This means that for every 10,000,000,000 anti-matter particles there are 10,000,000,001 matter particles, an asymmetry of 1 particle out of 10 billion. And the endresult is that every 10 billion matter/anti-matter pairs annihilated each other leaving behind 1 matter particle and 10 billion photons that make up the cosmic background radiation, the echo of the Big Bang we measure today. This ratio of matter to photons is called the baryon number. Even though the baryon number is extremely small (10-10) why isn't it zero? In Nature, there are only three natural numbers, 0, 1 and infinity. All other numbers require explanation. What caused the asymmetry of even one extra matter particle for every 10 billion matter/anti-matter pairs? One answer is that the asymmetry occurs because the Universe is out of equilibrium. This is clearly true because the Universe is expanding, and a dynamic thing is out of equilibrium (only static things are stable). And there are particular points in the history of the Universe when the system is out of equilibrium, the symmetry breaking moments. Notice also that during the inflation era, any asymmetries in the microscopic world would be magnified into the macroscopic world. One such quantum asymmetry is CP violation. As the Universe expands and cools and the process of creation and annihilation of matter/anti-matter pairs slows down. Soon matter and anti-matter has time to undergo other nuclear processes, such as nuclear decay. Many exotic particles, massive bosons or mesons, can undergo decay into smaller particles. If the Universe is out of equilibrium, then the decay process, fixed by the emergent laws of Nature, can become out of balance if there exists some asymmetry in the rules of particle interactions. This would result in the production of extra matter particles, rather than equal numbers of matter and anti-matter. In the quantum world, there are large numbers of symmetric relationships. For example, there is the symmetry between matter and anti-matter. For every matter particle, there is a corresponding anti-matter particle of opposite charge. In the 1960's, it was found that some types of particles did not conserve left or right-handedness during their decay into other particles. This property, called parity, was found to be broken in a small number of interactions at the same time the charge symmetry was also broken and became known as CP violation. The symmetry is restored when particle interactions are considered under the global CPT rule (charge - parity - time reversal), which states that that a particle and its anti-particle may be different, but will behave the same in a mirror-reflected, time-reversed study. During the inflation era, the rapid expansion of spacetime would have thrown the T in CPT symmetry out of balance, and the CP violation would have produced a small asymmetry in the baryon number. This is another example of how quantum effects can be magnified to produce large consequences in the macroscopic world. CP violation, by itself, is not sufficient to resolve the matter/anti-matter assymetry. However, it is an example of what may be a class of reactions that produce more matter than anti-matter. The sum of these reactions explains the baryon number. The Universe is now 1 minute old, and all the anti-matter has been destroyed by annihilation with matter. The leftover matter is in the form of electrons, protons and neutrons. As the temperature continues to drop, protons and neutrons can undergo fusion to form heavier atomic nuclei. This process is called nucleosynthesis. Its harder and harder to make nuclei with higher masses (because more protons mean more positive charge and more electrostatic repulsion). So the most common substance in the Universe is hydrogen (one proton), followed by helium, lithium, beryllium and boron (the first elements on the periodic table). Isotopes (nuclei with extra neutrons) are formed, such as deuterium and tritium, because the neutron has no charge and is absorbed by the nuclei. However, these elements are unstable and decay into free protons and neutrons. The rate of nucleosynthesis is set by the density of nuclei per cc in the early Universe, in other words, the cosmic density parameter, Ω M.
Note that this above diagram refers to the density parameter, ΩM, of baryons, which is close to 0.02. However, much of the Universe is in the form of dark matter (see later lecture). 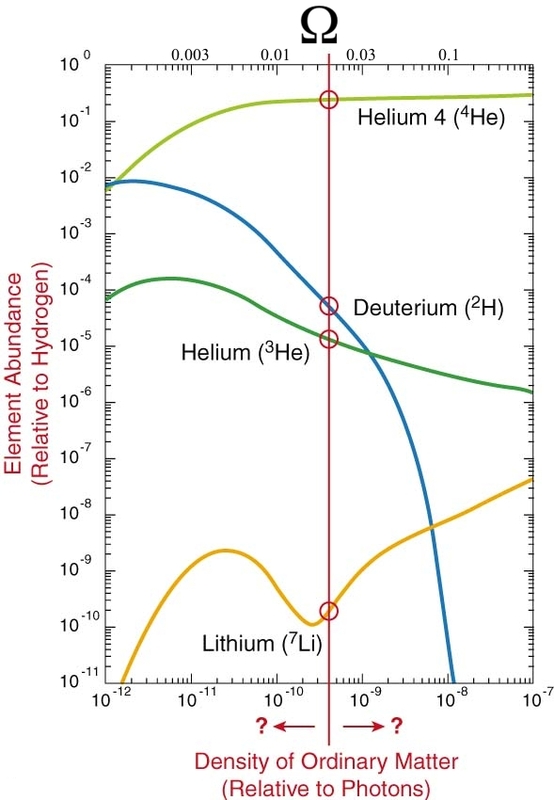 A key point is that the ratio of hydrogen to helium is extremely sensitive to the density of matter in the Universe (the parameter that determines if the Universe is open, flat or closed). The higher the density, the more helium produced during the nucleosynthesis era. The current measurements indicate that 75% of the mass of the Universe is in the form of hydrogen, 24% in the form of helium and the remaining 1% in the rest of the periodic table (note that your body is made mostly of these `trace' elements). Note that since helium is 4 times the mass of hydrogen, the number of hydrogen atoms is 90% and the number of helium atoms is 9% of the total number of atoms in the Universe. There are over 100 naturally occurring elements in the Universe and classification makes up the periodic table. The very lightest elements are made in the early Universe. The elements between boron and iron (atomic number 26) are made in the cores of stars by thermonuclear fusion, the power source for all stars. The fusion process produces energy, which keeps the temperature of a stellar core high to keep the reaction rates high. The fusing of new elements is balanced by the destruction of nuclei by high energy gamma-rays. Gamma-rays in a stellar core are capable of disrupting nuclei, emitting free protons and neutrons. If the reaction rates are high, then a net flux of energy is produced. Fusion of elements with atomic numbers (the number of protons) greater than 26 uses up more energy than is produced by the reaction. Thus, elements heavier than iron cannot be fuel sources in stars. And, likewise, elements heavier than iron are not produced in stars, so what is their origin?. The construction of elements heavier than involves nucleosynthesis by neutron capture. A nuclei can capture or fuse with a neutron because the neutron is electrically neutral and, therefore, not repulsed like the proton. In everyday life, free neutrons are rare because they have short half-life's before they radioactively decay. Each neutron capture produces an isotope, some are stable, some are unstable. Unstable isotopes will decay by emitting a positron and a neutrino to make a new element. Neutron capture can happen by two methods, the s and r-processes, where s and r stand for slow and rapid. The s-process happens in the inert carbon core of a star, the slow capture of neutrons. The s-process works as long as the decay time for unstable isotopes is longer than the capture time. Up to the element bismuth (atomic number 83), the s-process works, but above this point the more massive nuclei that can be built from bismuth are unstable. The second process, the r-process, is what is used to produce very heavy, neutron rich nuclei. Here the capture of neutrons happens in such a dense environment that the unstable isotopes do not have time to decay. The high density of neutrons needed is only found during a supernova explosion and, thus, all the heavy elements in the Universe (radium, uranium and plutonium) are produced this way. The supernova explosion also has the side benefit of propelling the new created elements into space to seed molecular clouds which will form new stars and solar systems.